Realist Horse Painting from Peru, "Untamable"
Rearing and dancing with lithe grace, a spirited stallion reveals a proud, strong character. 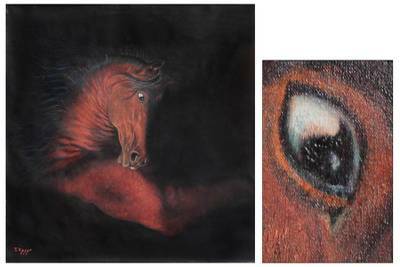 Theus captures the might and power of this beautiful horse, each muscle tensed with energy in a compelling equine portrait. "Headstrong and untamable, this horse cannot be ridden by even the best horsemen," the Peruvian artist confides. "You can perceive an air of greatness in his gaze, and the creature's fierce pride." Titled "El indomable" in Spanish.